Hello again. Another blog, and another great social event thanks to SLA-Europe. I’m on the Board, so I would say that. However, it was a very good way to spend a Summer evening (raining of course!) 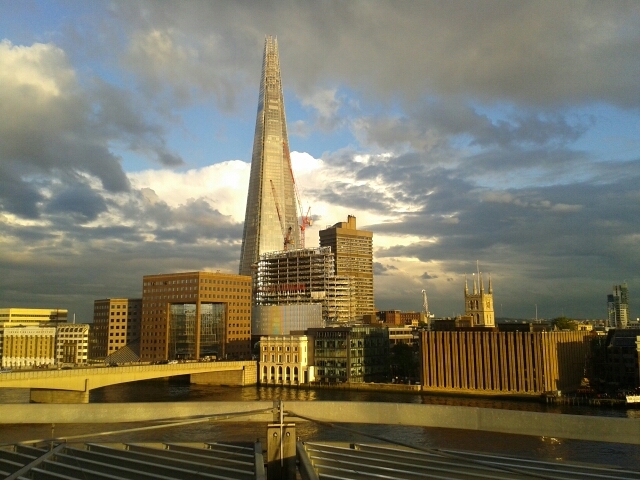 look at the cloud formation surrounding my photo of the Shard. This was taken from the Roof Terrace of the offices of Nomura International Plc, Angel Lane EC4. I met many old faces and many new ones at this event and spoke with people on a wide range of topics which included Client ID and Know-Your-Customer (KYC); SharePoint; Barclays; SharePoint; working in the Inner Temple as a Librarian when you trained as a Barrister; SharePoint and why it is such a great product; redundancies; SharePoint and why you wanted to lose it instead of use it; SCIP (Society of Competitive Intelligence Professionals) raised twice by others with negative/positive commentary; SharePoint…etc. I’m sure you get my drift by now. I also work with SharePoint, so it was totally mesmerising to see this as the buzzword for the evening, with everyone I spoke to. People clearly have a certain ambivalent relationship with this particular piece of software. The event was sponsored by the Financial Times, Integreon and 7Side. I’m heading back to the KYC topic. After following Transparency International (TI) for many years now for its amazing corruption reports, I’d like to introduce you to Privacy International (PI) as well. I wrote about TI and focussed on PI in my book on pages 161-165 and highlighted that at that time of writing, Privacy Internationals’ view was that they had “found numerous deficiences and hostilities in Google’s approach to privacy that go well beyond those of other organisations”. (Privacy International, A Race to the Bottom: Privacy Ranking of Internet Companies 2007. So, has anything changed for the better since then? You know how to look this up……. And so we move on to the Anti-Social Network. I thought that the Murdoch/News International scandal into privacy was the fat end of the wedge in privacy abuse, but it’s (almost) the opposite if compared to other means that are being used to upset and hurt people. On 21st March, Richard Bacon reported on BBC 3 about the Anti-Social Network. While I was aware that the Internet has been used for abusive purposes for a long time now, the full extent of the abuse was brought sharply into focus with this hard-hitting documentary. Richard described how not only has he and his family been a target of abuse – known as Trolling – but he highlighted how Trolls also target RIP sites and launch a tirade of abuse at the recently deceased and their families. It’s a sick world when that’s the best that people can manage when harnessing the power of the Internet and all the fabulous technology that surrounds it. 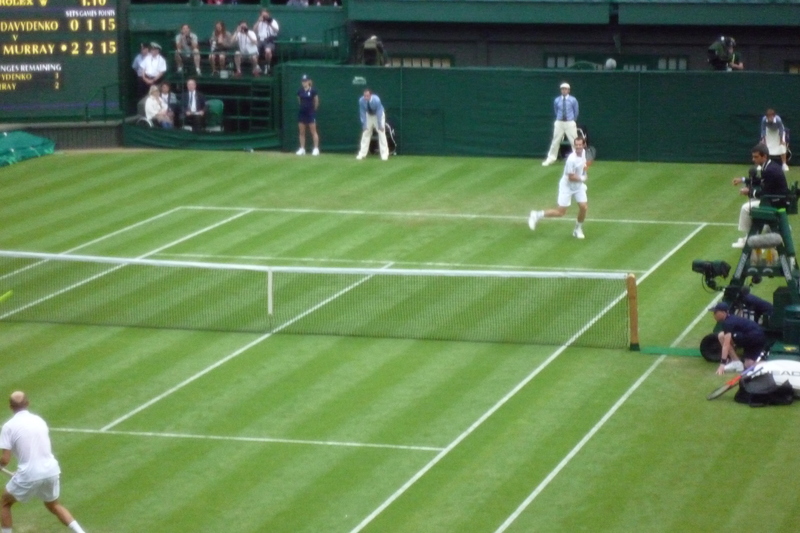 It would seem fitting to leave this post on a lighter note, and so I give you Andy Murray on Centre Court at Wimbledon! What an amazing player. I was upset when he lost the Championships, but await his strong performance in the Games. Gold would be brilliant. Hello again, I did say I’d be back again quite soon – and here I am. I have just responded to a colleague on Twitter who couldn’t locate a specific article, and it’s a bit of an eye-opener, even though it doesn’t tell me anything I didn’t already know. Once upon a time I took a contract position in a University teaching information literacy – which included beginners to advanced Internet research as one of the topics. It was a popular module and well attended by the students, but the first time I taught this particular topic, I was expecting the students to wipe the floor with me, after all – this is THEIR generation – isn’t it? They didn’t – far from it. I sparked their imagination with the huge array of search strategies and tools for the job at hand. The article I sent to my colleague is about a report sponsored by JISC and the British Library entitled The “Google Generation” not so hot at Googling , after all and it’s written by Nate Anderson. How’s this for a front cover? If they wanted shock factor – they achieved it. That’s just horrid! The report is called: Information behaviour of the researcher of the future, and you’ve got the url to read this fascinating study for yourself. But I liked Nate Anderson’s comments about plagiarism and instant gratification because it mirrors a blog about young employees searching Google to sort out their corporate tech problems instead of calling the help desk. ServiceDesk360 posted the blog Young employees ignore helpdesk, search Google instead. Bomgar, who researched this corporate behaviour, says these employees are known as “Millennials”. Hmmmm…..I could call them something but it wouldn’t necessarily be “Millennial”. The founder of Project Gutenberg , Michael S Hart, passed away recently. If you don’t know what Project Gutenberg is – you may be reading the wrong blog. Apparently there are 37,000 e-books freely available and that is a sheer amazing legacy to leave to the world. An article in The Atlantic says: “In an obituary on the Project Gutenberg website, Hart is remembered for the depth of his commitment to literacy. But the early texts speak to a core civic hope that is related but distinct: that there is power in ideas and that by spreading them we could make this country better. Sure, the number-one most downloaded book on the site is, by a long shot, the Kama Sutra, with more than 25,000 downloads. But Michael S. Hart, and by association his project, were about something much bigger than that.” Thank you so much Mr Hart for leaving such a great legacy to the world; rest in peace. The Ultimate Insult has arrived in the form of an article twittered by another colleague Arthur Weiss. This time I am definitely not at a loss for words. Disgraceful! How dare the US government and their “security logistics” tactics get in the way by banning firefighting heroes from attending such an important event – and on the 10th anniversary of this sad occasion. They lost people too. This is unbelievably disrespectful. Firefighters – ignore all and do as Arthur says: Just turn up anyway. 9/11 – show some respect and include the firefighters. You may or may not know that I have data coming in from quite a range of resources, including those from MI5 and the FBI. The FBI has a Gotcha section and recently they highlighted Operation Double O. I cannot believe anyone could be stupid enough to carry out a robbery, blow their nose and then leave a dirty tissue for forensics to play with the DNA. Have a look at the podcast. There’s more to come – but I’ll leave you with this for now. Back again soon. The Hunter-Hawker display above and below we have – A DeLorean! Apparently there’s 6,500 DeLoreans still around somewhere! Back to the Future. Check out the Seagull doors! I always look for the darker side of social networking, and the uses that it can be put to – only from a researchers’ perspective – I hasten to add, especially in this day and age. Did you hear on the vine that Goldman Sachs have a rogue Tweeter in their midst, who may be riding the lifts/elevators in order to eavesdrop on conversations and tweet them? The New York Post reports that Goldmans are trying to find out who is twittering on Twitter feed @gselevator, and they have even unsuccessfully attempted to force Twitter to freeze the account. Is Goldmans being a total twit (as in twit/twitter – oh forget it…) to worry about this in the first instance? Hey – what’s a bit of reputational risk banter in the elevator amongst the heavily-wedged few? Maybe the ones who boast of their privileged excess in times of hardship for the benefit of the rest of us should learn to keep their mouths shut instead. The diversity of social networking just never fails to amaze. Around where I live, we’ve had a spot of bother from rioters, who have totally destroyed Croydon and then attempted to trash Sutton a week or so later. I was sent the Looter’s Prayer, which is indicative of our times and was posted on Facebook by my colleague, Arthur Weiss. Apparently, the manager at Waterstones Bookshop in Sutton commented on the rioting that was attempting to break out in Sutton with: “I’m going to keep my shop open. At least if they loot my store, the bu**ers might learn something”. Very well said! One of my sons came home a couple of weeks ago and told me that one of his friends had visited his doctor because of teenage spots. The doctor went online, Googled “spots and teenagers” and printed off a page from Wikipedia and handed it to him. I understand that doctors earn circa £100k p.a. and if that’s the best they can do for their over-inflated salary then I’m at a loss for words. Actually, I’m rarely at a loss for words, but that’s irrelevant. Anyone who is anyone knows that Wikipedia is fundamentally flawed data because anybody can update it. It is proved that people purposely update Wikipedia with utter rubbish. Do our GPs need educating? It surely looks that way. I suggest this doctor takes a look at Mumsnet.com or the BBC or even the NHSDirect web site where information is somewhat more reliable. TTFN, as my Grandfather used to say. I’ll be back again, sooner than usual with some more commentary when school starts. Google has been a bit prolific in recent weeks with its artwork/doodles commemorating various anniversaries,http://www.google.com/logos/index.html but I particularly liked their 21st June First Day of Summer (below) Madness artwork and the 22nd July interactive artwork celebrating Alexander Calder’s 113th birthday. The Google Doodles collection goes right back to 1998.
Business Librarians (BUSLIB) has a new group on Facebook buslib@groups.facebook.com which you can join and participate with research queries, discussions, and more. Here’s the page: https://www.facebook.com/groups/buslib/?ap=1 While I’m on the subject of social networking, I found another group on LinkedIn called Interns over 40. This is a goldmine for the skilled worker seeking employment, who is on the mature side, and finding it difficult to move into that next position. http://internsover40.blogspot.com/2009/09/100-tips-tools-for-job-hunters-over-45.html and with over 500,000 hits in 2010, it is a popular blog, with a huge amount of sound advice. The link I have provided is for a blog called 100 tips and tools for hunters over 45.
and I’m sure you can do a lot better. Come on – show me what you’ve created! Rebekah Brooks and the phone-hacking scandal that has wreaked havoc on Murdoch’s empire. Over the years, I have known a number of business people who are “Teflon Coated”. She’s one of these people, and pleads ignorance to ensure that nothing sticks. Private Eye’s latest issue is having a field day with this scandal; they have called themselves Private Eye incorporating News of the World and the headline is “GOTCHA! Murdoch goes down with all hacks”. About 80% of this edition is Murdoch-related reportage, and given that the bigger breaking news happened just 24 hours before the next print run, I can only surmise that Private Eye’s hacks have been compiling their data for a while, in readiness for this scandal to break. Finally, I wouldn’t normally comment on something like this – but – Amy Winehouse – you silly girl. What an incredible waste of a great talent. “LEGAL WARNING: Our science & technology team has recently launched Google web software to protect and secure all Gmail Accounts. This system also enhanced efficient networking and fully supported browser. You need to upgrade to a fully supported browser by filling out the details below for validation purpose and to confirm your details on the new webmaster Central system. Note: Your account will be disabled permanently if you failed to provide the details required above within 72hours. Gmail will not be held responsible for your negligence.